EgyptAir Flight 804 Disaster Adds To Egypt's Litany Of Woes : Parallels Egypt's government faces mounting criticism. There's an insurgency in the Sinai Peninsula. The tourist industry is in tatters. And now, add to that a second aviation disaster in just over six months. Egyptian President Abdel-Fattah el-Sissi (right), hosts U.S. Secretary of State John Kerry at the presidential palace in Cairo on Wednesday. Sissi has touted his ability to bring order, but the country has looked increasingly shaky recently. The cause isn't yet known, but the loss of an Egyptian plane into the Mediterranean has already delivered a new round of trauma to a beleaguered country struggling on several fronts. 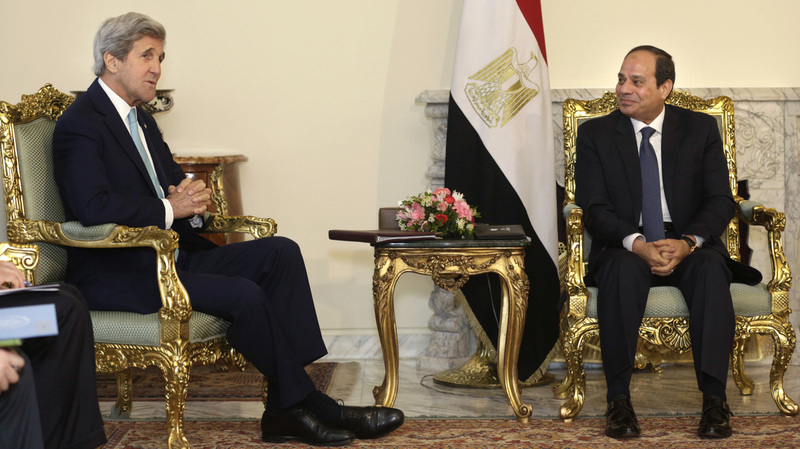 President Abdel Fattah el-Sissi's hardline rule faces mounting criticism at home and abroad. An ISIS-linked group is waging an insurgency in the Sinai Peninsula. The tourist industry has been in the doldrums for years. And the EgyptAir plane that vanished early Thursday marked the country's second aviation disaster in just over six months. Sissi's strongest argument for his three years of tough rule has been delivering a modicum of stability in a region plagued by civil wars, struggling to absorb millions of refugees and confronting general chaos. But cumulatively, Egypt's woes are now making the most populous Arab nation look increasingly shaky. "Since his accession to power, President Abdel Fattah el-Sissi has made decisions that are undermining both Egypt's domestic stability and key American policy goals in the region," Tamara Cofman Wittes, a former State Department official, now at the Brookings Institution, wrote recently. Sweeping Crackdowns: Many activists say Sissi has proved even more repressive than the former president, Hosni Mubarak, who was ousted in a popular uprising in 2011 after three decades of rule. President Sissi "leads a country that remains in a human rights crisis," according to Human Rights Watch. "Authorities have effectively banned protests, imprisoned tens of thousands — often after unfair trials — and outlawed the country's largest opposition group, the Muslim Brotherhood." Nearly 500 people died in custody or were killed by security forces last year, according to the El Nadeem Center for Rehabilitation of Victims of Violence. The center, which has documented abuses by the security forces for more than two decades, is battling to remain open as the government moves to silence its critics. In the West, the case that's drawn the most attention is that of Giulio Regeni, a 28-year-old Italian graduate student whose body, with marks of torture, was found on the outskirts of Cairo in February. Italy has been highly critical of the Egyptian investigation, including the Egyptian claim that he was not detained by police. But Reuters, citing Egyptian security sources, reported recently that Regeni was in police custody shortly before his death. 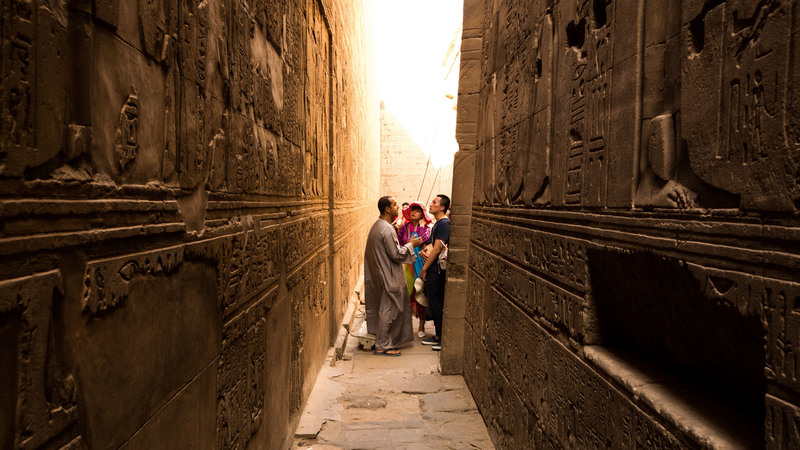 Tourists visit the ancient Temple of Edfu in Aswan, Egypt, last September. Tourism in Egypt has been depressed for five years, and the loss of an EgyptAir plane on Thursday is expected to be another blow to the industry. A Fragile Economy: Egypt's long struggling economy now appears especially vulnerable, according to many economists. Egypt last month transferred two uninhabited Red Sea islands to Saudi Arabia, a move that came as Saudi Arabia's visiting King Salman pledged a multi-billion-dollar aid package. Egypt said it was simply returning islands the Saudis had handed over in 1950, but many Egyptians didn't buy it, taking to the streets and accusing Sissi of selling off Egyptian land for cash. Under Sissi, the economy "has markedly deteriorated, precipitated by declining tourism and Suez Canal revenues, as well as a persistent Islamist insurgency led by ISIS," David Schenker wrote earlier this week for the Washington Institute for Near East Policy. A big part of the problem is a once-thriving tourist industry that's shriveled. Egypt used to host 15 million visitors a year, but the numbers dropped dramatically after the 2011 uprising and have been below 10 million a year since then. The broader Middle Eastern turmoil has scared away many Westerners. But Egyptians have contributed to the problem as well. Egyptian security forces fired on Mexican tourists last September, mistaking them for militants and killing 12 visitors and their guides. Tourism has been further depressed since Wilayat Sinai, an Islamist group linked to the Islamic State, claimed responsibility for blowing up a Russian charter plane filled with tourists last October. Relations With The U.S.: The U.S. is still providing $1.3 billion in military aid to Egypt and has generally refrained from public criticism of its longtime ally. However, Samantha Power, the U.S. representative to the United Nations, last week put the Egyptian government on notice for its recent crackdown on the Egyptian media. "Attacking the media will not produce a more compliant citizenry," Power said at the U.N. Security Council. "It will produce a more alienated, suspicious and disenfranchised public, one more likely to chafe under a government's attempts at control, all to the benefit of terrorist groups." Meanwhile, the U.S. military is particularly concerned about some 700 U.S. peacekeeping troops who have been stationed for decades in the northern Sinai Peninsula to monitor the 1979 peace treaty between Egypt and Israel. While that treaty is still holding strong, the U.S. is worried the troops are vulnerable to attack by the ISIS-linked group, Wiliyat Sinai. "Egypt's looming instability demands that the United States take steps now to safeguard itself from reliance on a country we cannot rescue, not least from its own leaders' worst impulses," wrote Wittes, of the Brookings Institution.